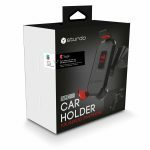 Car holder significantly improves using of the smart phone during driving. 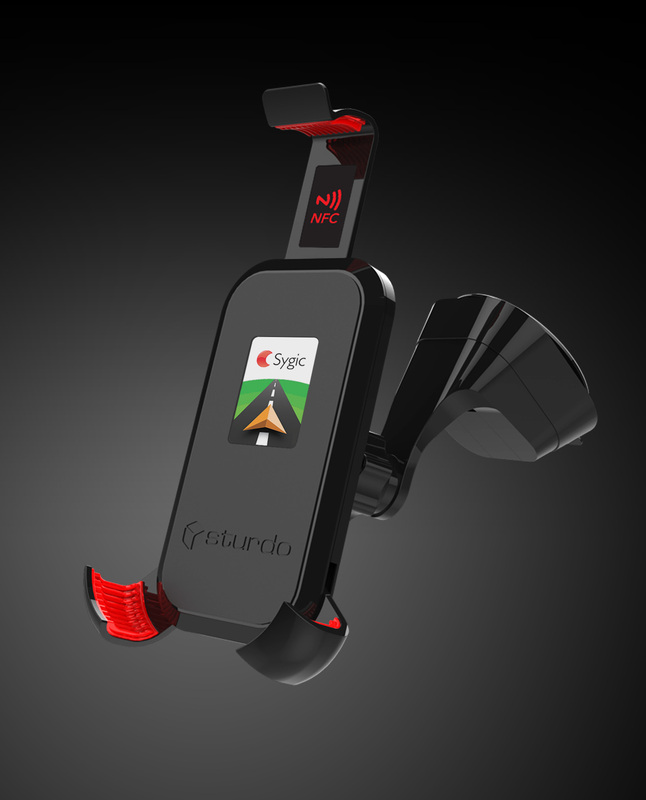 Built-in NFC chip automatically starts the Sygic navigation on your phone. You do not need buy it separately, Sygic Voucher is included in package. 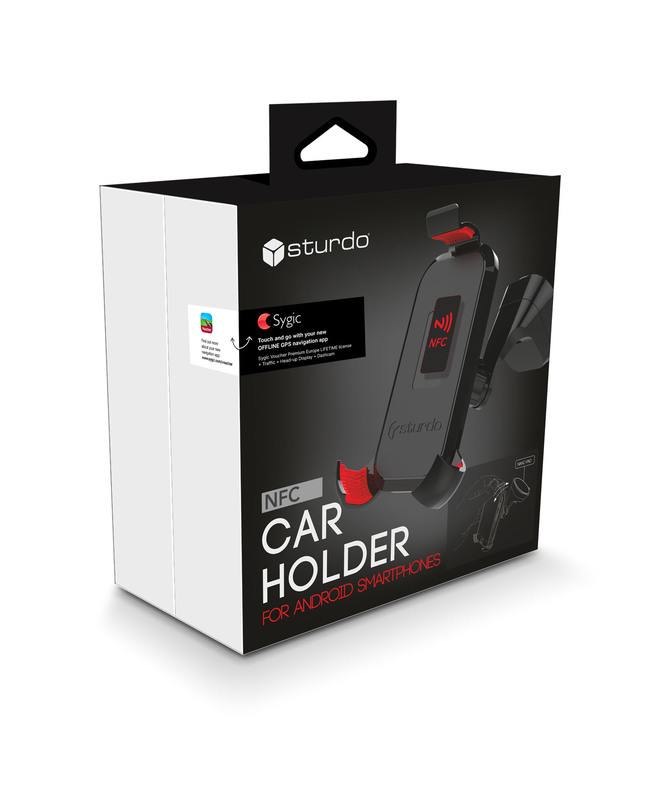 Sturdo Car Holder Pro Sport is a practical and elegant helper in your car. Thanks to its design and safety features it has several advantages. 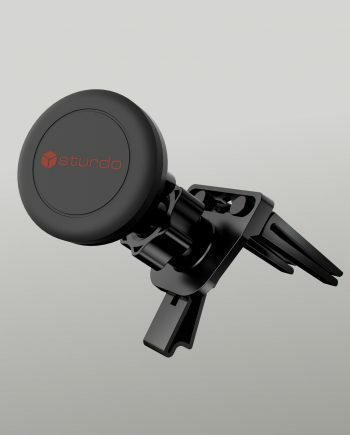 Adherence is firm thanks to washable nano suction cup, with the possibility of mounting on the windscreen or dashboard of the vehicle. 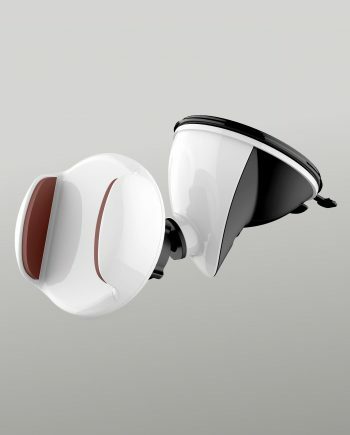 The front side of the head is made of hardened foam and rubberized adjustable side arms. Fixing with 3 side arms simplifies handling of the stand with one hand. 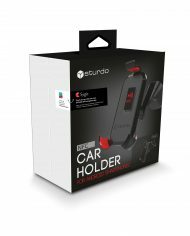 Side arms greatly dampen vibrations of the phone while driving. Lower side arms are rotating in the opposite direction up to 30⁰. Hardened foam head prevents damage to the back of the phone. 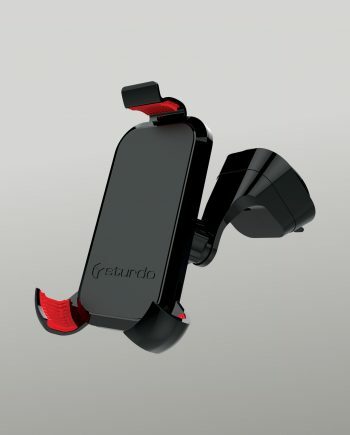 Holder is suitable for phones ranging from 55×120 to 80×155 mm in size. Driving with Sygic Voucher Edition is easy and safe. 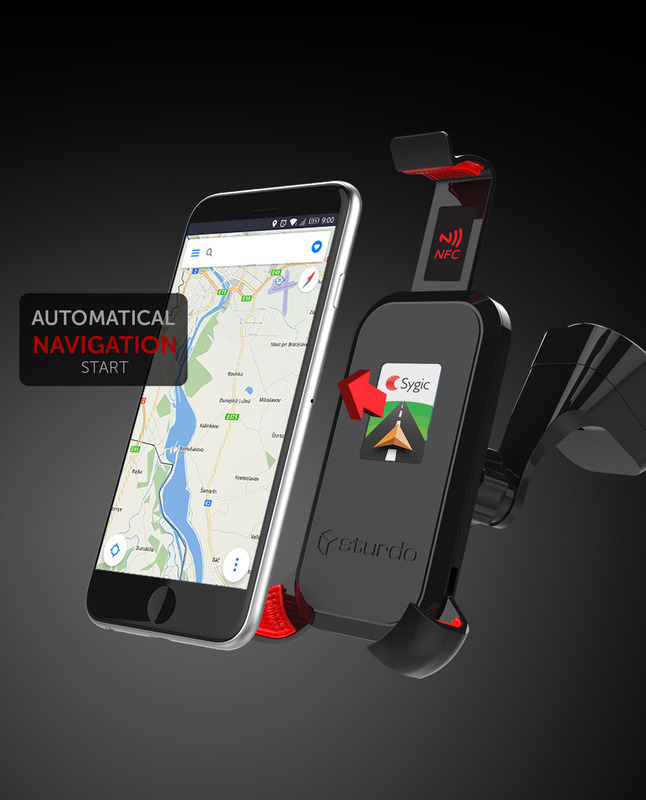 The application even helps you save money along your route thanks to many innovative features. 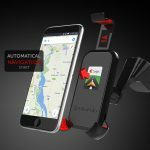 Navigation includes high-quality 3D maps that are stored on your phone or tablet so that no internet connection is required for navigation. Regular map and application updates are free of charge. Sygic Voucher Edition is ideal for customers who need help with installation or search for a great gift for their loved ones. Sygic Voucher Edition will guide you safely to your destination even without an internet connection, but that”s not nearly all this app can do. With Sygic Voucher Edition, you will escape the traffic or find the best parking spot. You will also have up-to-date information about fuel prices on petrol stations, and you will avoid speeding tickets with speed limit and speed camera warnings. Offline Maps with Lifetime Updates-Sygic Voucher Edition with offline maps always works, even when there is no internet connection. With the latest offline maps stored on your smartphone or tablet, you don”t need a data signal to stay on the right path. You will receive multiple updates of your maps every year, including up-to-date information about the road network, addresses, and Points of Interest. Voice navigation – don”t take your eyes off the road, focus all your attention on driving and stay safe while following the continuous spoken turn-by-turn instructions. 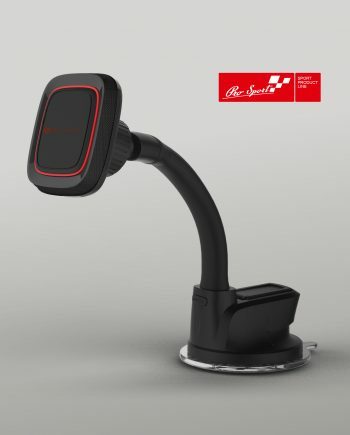 Voice-guided navigation with Spoken Street Names will provide you with precise instructions that tell you the names of streets and cities, as well as the directions and distance to each maneuver. Speed limits – drive with Sygic Voucher Edition, and you will always know the current speed limit, even when you miss a sign. 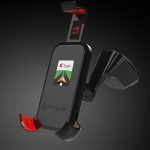 You will get clear visual and voice alerts every time you exceed the speed limit. For increased safety and a smooth driving experience, Sygic will also warn you about the upcoming speed limit change before it becomes effective so you can adjust your driving accordingly. Head-up Display – drive safely at night. Head-up Display projects optimized navigation instructions onto the car”s windshield so that you don”t have to take your eyes off the road while driving. All the necessary instructions are projected directly into your line of sight, so you can focus on driving. Dashcam is a great feature that continuously records video of the last 5 minutes of your drive. There is no need to spend money for a dashboard camera, your phone and our navigation app are perfectly capable of doing the job. And you don´t have to worry about the storage; the app only saves the recording after a simple tap on the screen. The video will be saved automatically in case of an accident.